It seems to me like I've been writing this post some days ago, but that was already nearlt two months ago! So many products have added up by now that I decided to show them to you. And you will already know some of them since they are ones I trust. Starting with the Pantene Pro-V shampoo, I want to add that I have two of those huge bottles that are empty, plus one bottle of the smallest size too. This gives you a rough idea od how much hair shampoo I need for washing my hair only twice a week! I am glad when I have those huge sizes because I know that I won't run out of them too quickly and I buy one a month approximately. I've said this so many times but this shampoo is by far the best I've used yet. It really makes my hair feel and look clean and washing it twice a week is enough to not look as if someone spilt a bottle of oil over my head. I am just in love with it and am scared of trying other shampoos now that I've found that this one is just perfect for me. Next you can see an empty pack of cotton pads and they were only £1 at ASDA and I never had those big cotton pads before so I decided to try them and this is actually my second pack already and I am in love with them! I didn't buy new ones yet and it feels so strange removing my make-up with the regular round cotton pads. Using those ones, one was enough to take off my whole make-up and that's just great! It also feels more comfortable in your hand, you can work more precisely in my opinion. So once I see them again they will be mine! Then you can also see my Clearasil face scrub with Vitamin E, oxidants and avocado and pomegranate extracts. Now, I'm in love with this scrub! It smells amazing, it does a great job and I've had it for ages! I didn't use it every day, but I'd say once a week and it removed my blackheads nicely, wasn't too harsh on my skin and some days ago there was an offer in Superdrug on all face cleansing products and I actually got two more of those! They cost around £4 and I definitely recommend them if you have similar skin to mine. 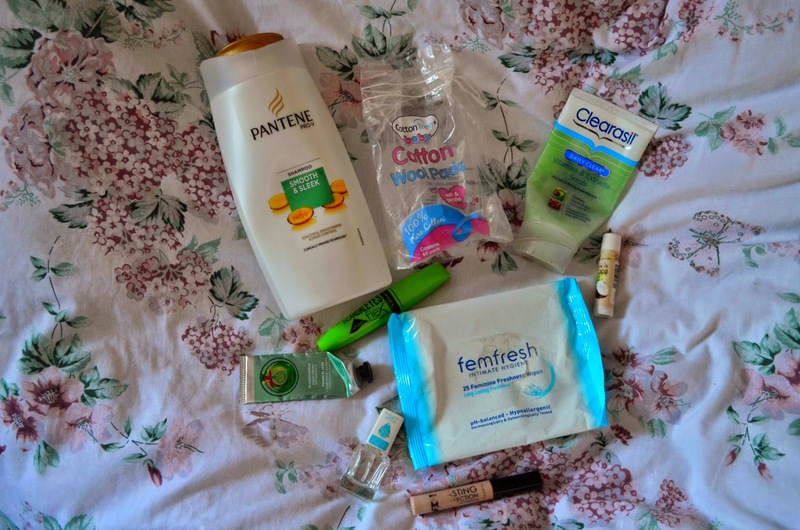 Looking at the last big thing in the picture, the femfresh wipes, are also a product I've been using for a longer time now and i am a big fan of them. ( even though the Nivea Intimo that I used to buy in Vienna were just heaven!) I usually buy them on offer because they are really expensive, so now I have two empty packs of them and got myself some Superdrug ones and walked into Boots after that just to find the femfresh wipes on offer. Still, I decided to not buy any more just at the moment and to use up the Superdrug ones first. The intimate wipes are practical for on the go, long days or travel and I would cry without them most likely. The last products are more beauty related, and they are for example two concealers from Collection. And this is a product I've been using for a year now and I really like this concealer. I didn't find one that would be better and I am even scared of buying others to try them and then to find out I've maybe wasted my money on a product that does not work with my face. But I am actually pretty happy with this concealer, even though I have days where my undereye circles are just so dark that you can still see them a bit and my face has gone really spotty over the last months and even if I use concealer on the spots, the redness is still visible. So I decided to just accept it and to cover as much as possible and to try and ignore the redness that you can still see, because there is not much I can do about it anyways. This concealer is pretty inexpensive at around £4 but to be honest, I use up one a month and I could get myself a MAC concealer for less money, that would probably last for longer, but I am scared of changing profucts! Mascara wise I've used up my Rimmel Scandaleyes Lycraflex one ( and repurchased it already) and when I first discovered this mascara two years ago I was so amazed by its effect and so I kept repurchasing it and swore by it! However now, I have a bit of a strange feeling about any other mascara than the Benefit Roller Lash and really want to get a full sized one because it works so well on my lashes. Still, this green Scandaleyes mascara works better than many other drugstore mascaras for me and I am trying to always have one of it in my collection, just in case I will need it. It is also only £6 or £7 and I guess for that price it is really good. I also used up my favourite lip balm, the Yves Rocher Noix de Coco, but since my mum got me a new one for Christmas, I am saved! I love its creamy texture, the smell and how it leaves my lips soft. I used to be a total lipbalm addict and every time I go to drugstores I just have to see all the lipbalms and I try so hard to not buy any new ones since I still have so many to use up. But I am dreaming of the Nivea Peach one at the moment. :( Still, thisis my favourite one and I have to make sure I always have it with me at work, in my bag when I am on my way to town or College and I also use it at home. It's like my best friend. Before Christmas I got the Body Shop Glazed Apple hand cream and it had the most amazing smell! I had it with me everywhear and loved the fact that my hands felt really nice after using it. I've probably used every single drop of it and it got definitely empty, so there is nothing I can do about it anymore , I can only wait until next Christmas and stock up again! I really liked the size it comes in, 30 ml, because it is perfect for everyday handbags, travel or just to keep it handy. It was just a perfect hand cream for me and since my hands got really dry lately, it would be difficult for me to survive if I didn't have my Soap&Glory Hand Dream! And the last product for today is my Bielenda nai hardener with diamond powder ( or so). It is a 10 in 1 treatment apparently and I bought it because I was desperate to get my nails to grow harder and longer. And even though they do still break, they don't break as quickly and as often as they used to and they are thicker for sure! I use this polish every day if I don't forget and once it gets scrachted off, I remove it and start again and paint them for some days in a row, before again, removing the nail polish and continue. I feel like this one actually really helped my nails, so I got another bottle when I was in Poland this Easter. Those were all the products I've collected over the last two months and now I'll get rid of them and start filling the bag with new empties! If you've tried any of those products I'd be happy to hear some reviews!